Analog This is a new segment where I shift the spotlight away from movies to focus on a TV show, old or new, that is worthy of your attention. With the glut of great comedy currently being shown on both network and cable television, I find myself wavering day-to-day on which one I can currently pin as my favorite. “Community” (which I can include because it is indeed coming back) is the most sophisticated and thought provoking. “Parks and Recreation” is the warmest and most consistently funny. “Louie” is the most daring and unique, like “Seinfeld” as a documentary shot by Woody Allen. Then, there is “Archer,” the most surprisingly witty of them all. 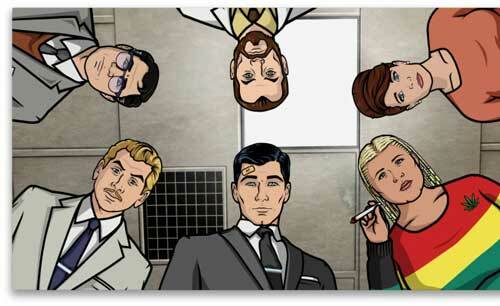 “Archer” is “Arrested Development,” “Mad Men,” and an Adult Swim show all rolled into one. The “Arrested Development” comparison is not one that should be used lightly, even though I am guilty of using it too often. However, if any show could objectively receive this honor, it should be “Archer.” Adam Reed, the show’s creator, has himself remarked on the show’s influence. Indeed, Jessica Walter voices Malory Archer, the aging, alcoholic head of the ISIS spy agency. Like her previous performance as Lucille Bluth, she also has a troubled relationship with her son(s), whom she always manages to both smother and distance herself from. Judy Greer once again plays a sometimes ditzy, but always unhinged secretary, while Jeffrey Tambor has a role in a few episodes here and there. “Archer” deserves the comparison much more because it takes the essence of what made “Arrested Development” so smart and so funny, and uses it perfectly. It is full of references ranging from literature to Burt Reynolds movies. Its constant use of wordplay and skewing of the English language is worthy of multiple viewings. Who knew an ongoing joke about idioms, seen in “Heart of Archness,” could be that funny? Go back to the very first episode, and see if you can understand that joke about “being into Greek” now. No matter how elaborate the jokes and references in “Archer” are, they can be within anyone’s range of understanding. They often just involve the kind of time and effort that a lot of shows don’t demand of their audience. Even if a reference does go over your head (it will happen), it doesn’t detract from the humor of an episode in any sense. “Archer” should truly be commended for being possibly the first show in history to reference “Hud.” And you can make fun of me all you want for actually getting that reference. Watching “Archer” can be like hanging out with a bunch of culturally aware kids who aren’t pretentious and are willing to clue you in on the reference, without specifically clueing you in on the joke. And of course there’s Mr. Sterling Archer himself, the alcoholic, mommy-issue riddled center of the universe (and the show). Sterling has the capacity to be both the dumbest and one of the smartest members of ISIS. What seems to get him in trouble most is not his intelligence but rather his ego and his inability to stop talking. “Archer” is an experiment of how long a character can talk, and how long a joke can go on, before it becomes hard to watch. “Archer,” now in its third season, has made some serious breakthroughs in its characters, and shows no signs of slowing down anytime soon. Recent episodes have explored Sterling’s dangerously addictive personality in ways that are both funny and tragic. The most recent episode saw him inadvertently causing the death of the man who might have been his father. It was a moment clarity and sadness that could bring the show in a new direction. But hopefully not too new: there can be no true “Archer” without a lewd, boozed up Sterling. *Sorry, but “Family Guy” was ruined for me after a certain point. This entry was posted in Analog This, Animation, Archer, Arrested Development, Comedy, FX on March 6, 2012 by ian0592.